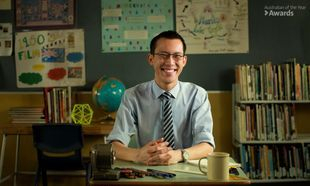 2018 Australia's Local Hero, mathematics teacher for the NSW Department of Education and TV Host of Teenage Boss, Eddie Woo has become an Australian household name and we are excited to announce him as our Charity Ambassador. Eddie Woo has been inspiring students across the globe through his YouTube channel, Wootube. Eddie has joined ausEE Inc., as our Charity Ambassador to help raise awareness for eosinophilic gastrointestinal disorders (EGID), a cause close to his heart. Eddie is a proud father with three children who all live with some form of allergic disease. This includes asthma, eczema and multiple immediate food allergies. One of them has an EGID, namely, eosinophilic oesophagitis (EoE). EoE is a rare allergic disease caused by eosinophils, a type of white blood cell, being found in above-normal amounts in the oesophagus which can cause inflammation and tissue damage. This has caused Eddie’s child to live with symptoms such as difficulty swallowing, vomiting, stomach pain and ‘failure to thrive’. Eddie has been teaching for 11 years and in 2012 when a student of his had Pancreatic cancer, he felt the urge to help as much as possible and started to record all of his lessons and post them on YouTube. It was astounding to see the amount of views, and his Wootube channel now has more than 323k subscribers and nearly eighteen million views. These videos are now helping people around the world not only understand maths but find joy in maths. For our ausEE members who have high schoolers, this extra assistance with maths has been invaluable for their students as many have experienced the impact living with a chronic illness can have on school work.